Egypt's great monuments overlook the transitions of the ages. Deep and brilliant royal tombs observe the vibrations of history. These 5,000 years passed are alive today in the people of Egypt, in the markets and squares, along the banks of the Nile and in the endless desert. Experience these wonders on a private tour with one of our hand-picked Egyptolgist guides. All of our overland touring in Egypt is privately escorted. If your tour includes a Nile cruise, the touring from the boat is escorted in small groups, except in our Ultimate Egypt program, in which your private guide will accompany you on the cruise. If you don't see what you're looking for in the published tours below, we'll tailor a program just for you. Custom tours are our specialty. Contact us and let's start designing your dream trip to Egypt today! Egypt sits at a crossroads between Asia and Africa in the northeastern corner of the African continent, bordering Libya to the west, the Mediterranean Sea to the north, Israel and the Red Sea to the east and Sudan to the south. The vast majority of Egyptians live in the Nile Valley, although the deserts to the east and west of the Nile comprise over 90 percent of the country’s land. Six oases scattered across the deserts are home to small communities. In the east, the Sinai peninsula extends into the Red Sea and forms the Gulf of Suez on the west and the Gulf of Aqaba on the east. The peninsula is desert in the north and mountainous in the south. The Red Sea is 7,785 feet deep, 1,207 miles long and 191 miles wide. The Great Rift Valley passes through the Red Sea. Early in 2011, a popular uprising succeeded in ousting President Hosni Mubarak after a 30-year autocratic reign. In June 2012 Mohamed Morsi was declared the winner in Egypt’s first competitive race for president. Egypt continues to adjust to this new political reality. Although the main attractions in Egypt are remnants of its brilliant past, the country today is quite modern and very international, especially in the large cities. Today, Egypt is an Islamic country and an Arabic republic, but it also retains some European flavor, the legacy of French and English occupation in the 19th and early 20th century. A more recent import is American popular culture in the form of junk food, movies and music. Because of all the foreign influence, modern Egyptian society is very worldly relative to other countries in the region. Despite embracing superficial aspects of European and American cultures, the behavior and attitudes of the Egyptian people are overwhelmingly shaped by Islam. The values of Islam (and to a small degree Coptic Christianity) provide guidance in all aspects of life. Most Egyptians strive to live in accordance with Muslim ideals of peace, tolerance, charity, compassion and a strong commitment to family. Hand in hand with the tenants of Islam goes a strong commitment to maintaining the honor and reputation of extended family and community. The result is a country with very little crime. The streets of Cairo are without a doubt safer than the streets of any large American city. Egyptians are naturally friendly and helpful. If you find yourself chatting with an Egyptian, don’t be surprised if a small crowd forms to join the conversation. Women in Egypt are relatively liberated. Literacy rates among women in the cities are high and are improving in rural areas as well. Percentages of professional women are on par with those of western countries. A lack of respect toward a woman in a public place is condemned and foreign women can visit Egypt safely. For most tourists visiting Egypt, the highlights are in and around Cairo, Luxor, Aswan and Abu Simbel. Cairo is located near the Nile delta in the north of Egypt. The Great Pyramids are located in Giza, about 20 miles from central Cairo, on the west bank of the Nile. 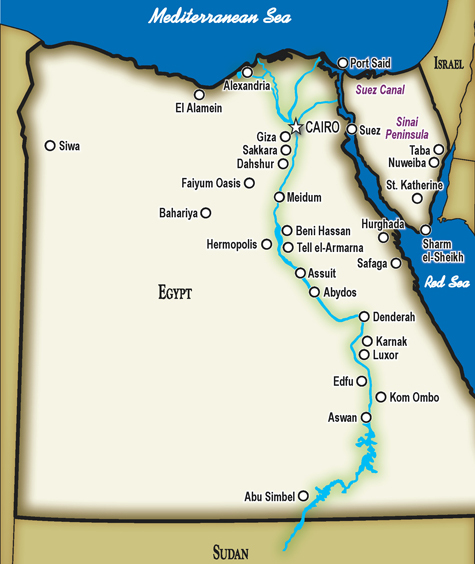 Memphis, Sakkara and Dahshur are other important sites near Cairo. The most popular visits in Cairo proper are the Museum of Egyptian Antiquities, where you can see treasures from the tomb of Tutankhamun and a room full of mummies, among other things; Old Cairo, with Roman ruins, Medieval churches, synagogues and mosques; and Khan El Khalili Bazaar, for great shopping. Luxor is about an hour south of Cairo by air, in the Nile Valley. Luxor is ancient Thebes, capital of ancient Egypt after Memphis. Karnak Temple and Luxor Temple are here, as well as the Temple of Hatshepsut and the Valley of the Kings, where brilliantly painted pharaonic tombs are hidden in the desert hills. Aswan is located in the far south, on the first cataract of the Nile. Most Nile cruises operate between Luxor and Aswan, stopping at temples (Kom Ombo, Edfu) and other sites of interest along the way. In the 1960s, the Aswan High Dam across the Nile created the massive reservoir of Lake Nasser, which extends nearly 350 miles from Aswan into northern Sudan. One of Egypt’s greatest attractions, the colossal twin temples of Abu Simbel, sits on the shores of Lake Nasser. Experience Egypt by Luxurious Private Van With Egyptologist Guide. We have mentioned only the most popular sites here. For repeat visitors or those with special interests, there is a great deal more to see and do. Give us a call if you need assistance navigating our published tours. If you don’t see what you’re looking for we are happy to customize a program for you.